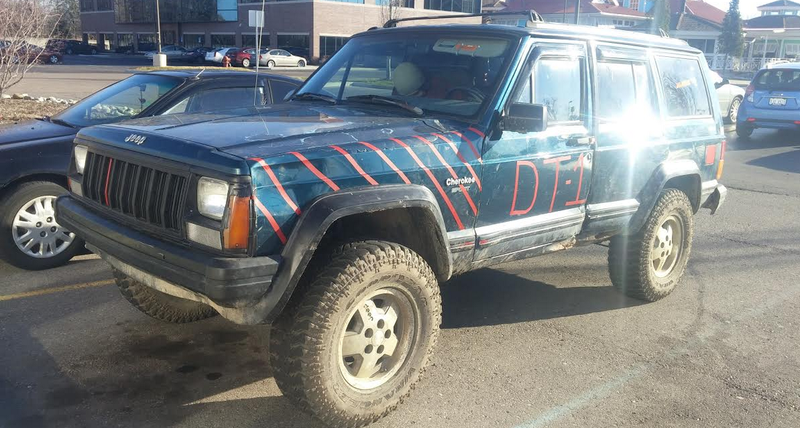 This morning, two friends and I hopped into my rust-bucket $600 Jeep XJ and started our long road trip to the 50th Easter Jeep Safari off-roading event in Moab, Utah. Here’s an update on #projectswisscheese. Can you do serious off-roading in Moab with a $600 Jeep? Next Easter, we’ll find out. A couple months ago, I bought a $600 1995 Jeep Cherokee to show the world that you don’t have to be rolling in dough to go off-roading in the slick-rock heaven of Moab, Utah. Since then my friends and I have been wrenching hard on this structurally-challenged box-on-wheels. Finally, last night, we finished her up. It was a big night for the tattered Cherokee. My friends and I bolted on the skid plates, pressed on a power-steering pump pulley to fix a loud belt chirp, fastened the rear bumper, and fixed the front headlights. And my friends went a little crazy with the red tape. After a few final torque checks, we went to bed at about 5 a.m., and woke up 45 minutes later with the intent to leave by 7 a.m.
Horrible mess notwithstanding, the Jeep is holding up well. Well, aside from the fact that every single fluid that could possibly leak is escaping its gasket and coating the undercarriage in oily goo. Otherwise, it’s doing fine after about 200 miles of travel. The Jeep feels comfortable at 75 mph, and even returns 14 miles per gallon. Double digits, folks! We’re on our way to Kansas City. Wish us luck! Feel free to check out my Twitter page for live updates.